Tonight is the last few hours to shop LOFT‘s surprise sale for 50% off everything plus free shipping on all orders (no minimum)! Use code SURPRISE. Valid online only. Select styles are now $20! Late night shoppers with a LOVELOFT store card or credit card may want to wait until the very end of the sale to shop. At 12-3AM ET the current 50% off promotion briefly overlaps with the automatic extra 15% off for card holders since it’s technically the first Tuesday of the month. 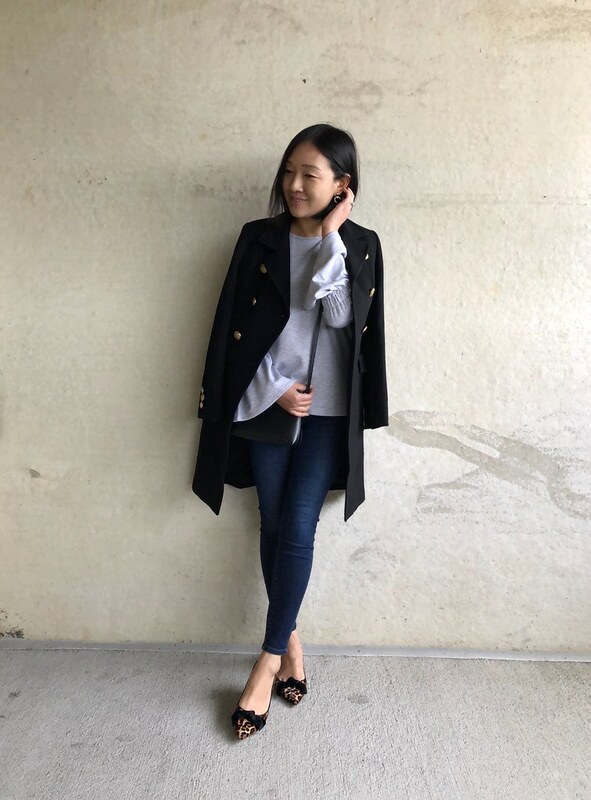 New to combining promotions when shopping online at LOFT? I talked about shopping during the sweet spot of the monthly, Tuesday cardmember discount in this post. As mentioned in yesterday’s post I took over @annlovesboston‘s Instagram stories. 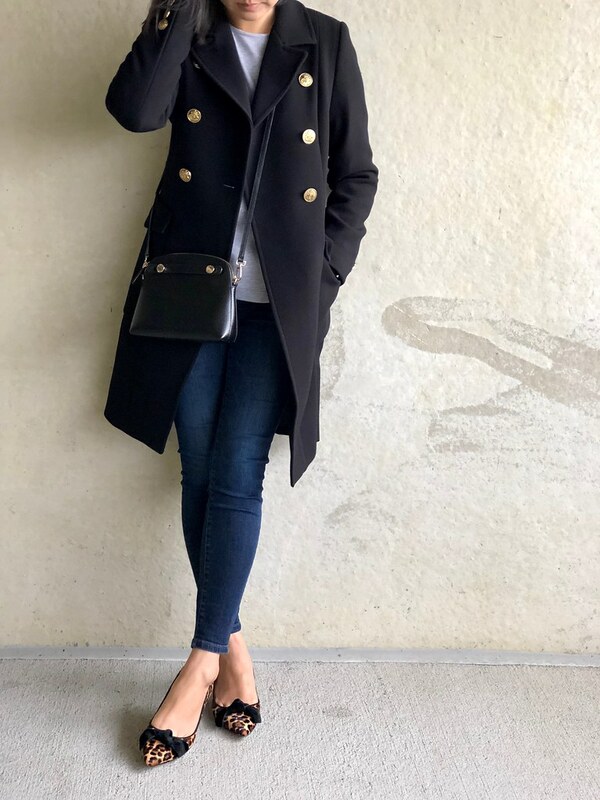 This is the first of two looks I shared and since it was chilly on Saturday out came this new double breasted coat I bought recently in store for 40% off plus an extra 25% off using my LOFT Cares card (Ann Cares cards are also available at Ann Taylor). 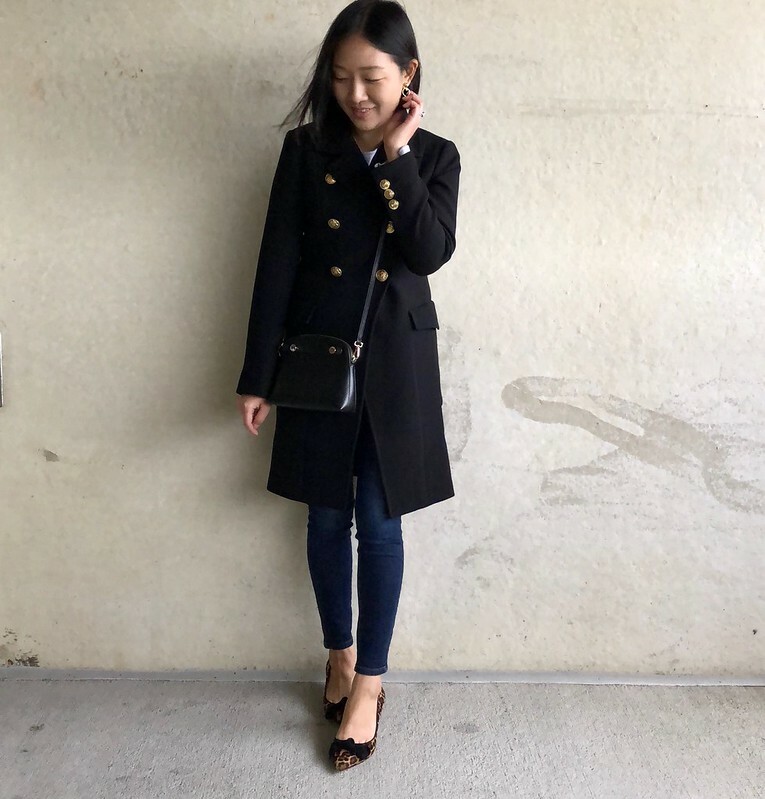 I took size XXSP for a more fitted look and I love how the coat looks worn open as well as buttoned up. 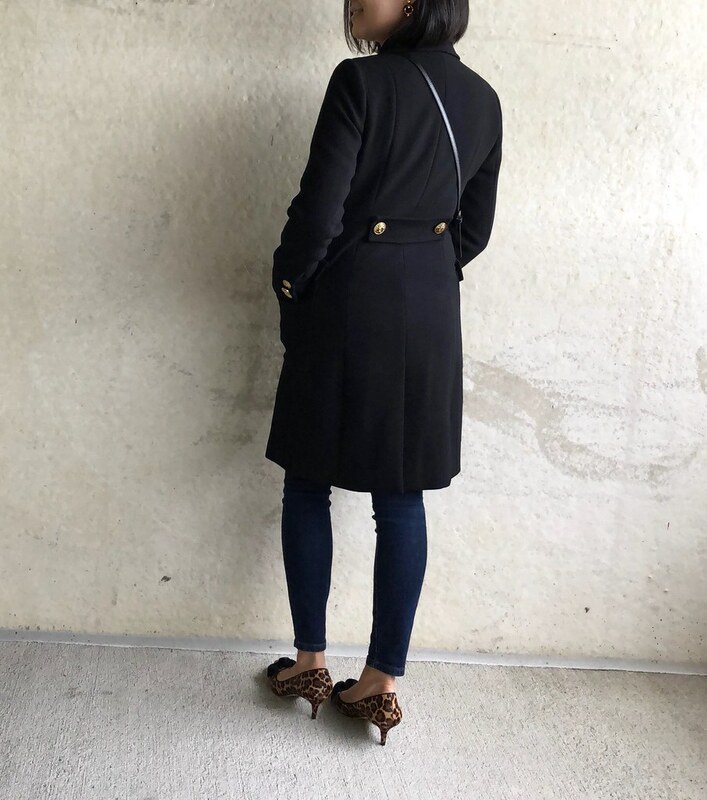 It’s a very chic medium weight fall coat that will be easy to layer since it’s a body skimming fit (not too tight but not loose and boxy either). If you’re unsure about sizing refer to my measurements here. 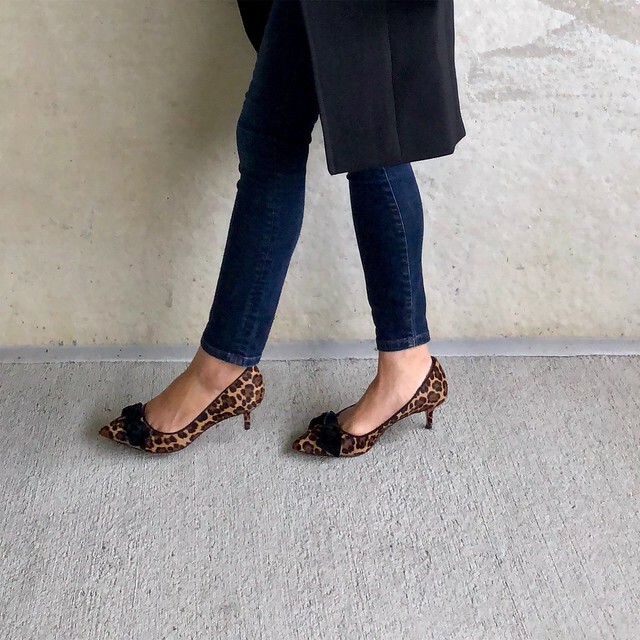 You’ll notice that I vary in sizing for LOFT tops but my preferred size is size XXS regular and XSP in LOFT tops (unless they run big in which case I size down to size XXSP) and size 24/00 regular or size 25/0P in LOFT jeans. If you’ve been eyeing this little Furla crossbody bag it’s currently on sale for $156 at Saks! It may look small but it fits all of my essentials (phone, wallet, tissues, keys, etc). I love this mockneck sweater and even though it contains 28% wool I don’t find it to be scratchy except for the mockneck which touches my neck. It also laundered well for me on cold wash and laid flat to dry (we have a front load, high efficiency washer). This sweater is currently only $20! I took size XS regular for a loose but still flattering fit since my preferred size XXS regular sold out online. I reviewed the striped version below in size XS petite. I love this soft pullover size it feels like I’m wearing a giant fuzzy sock. 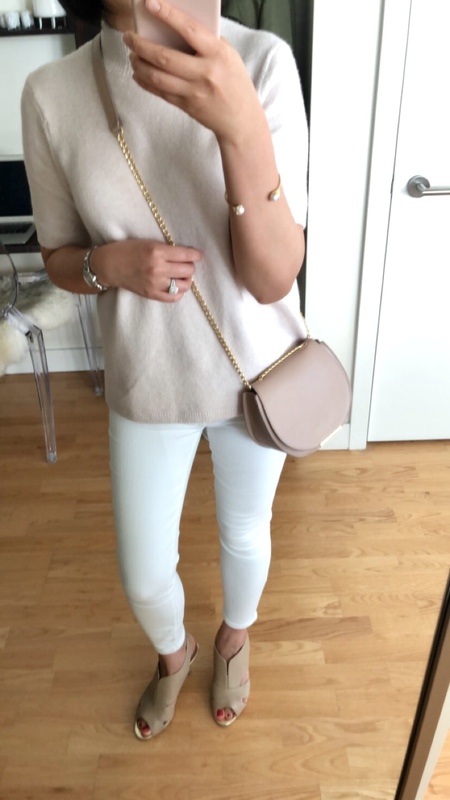 I reminds me of my favorite relaxed v-neck sweater from past season which I wore to death (2015, review here for the curious). I’m so glad I ordered it in my size since it’s one of the first sizes to go. Anything white and cozy tends to sell out quickly. I found that it fits true to size but the sleeves are a bit long on me which I don’t mind. 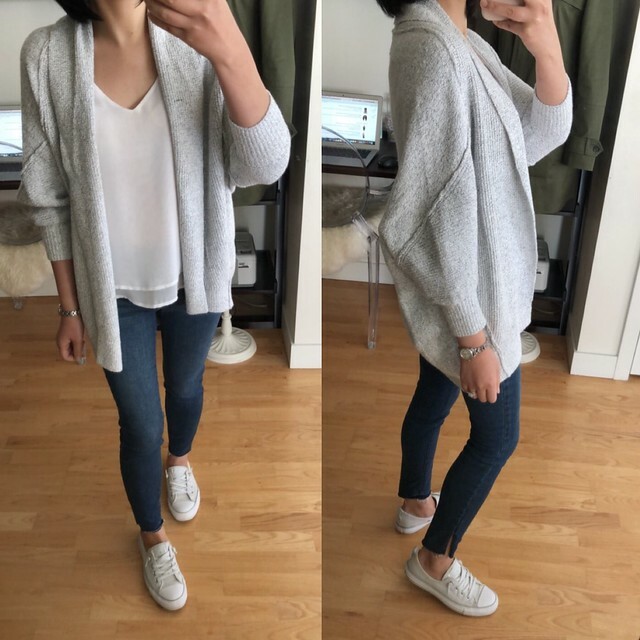 This popular cardigan is currently sold out online in the grey color but it’s also available in a darker color here. 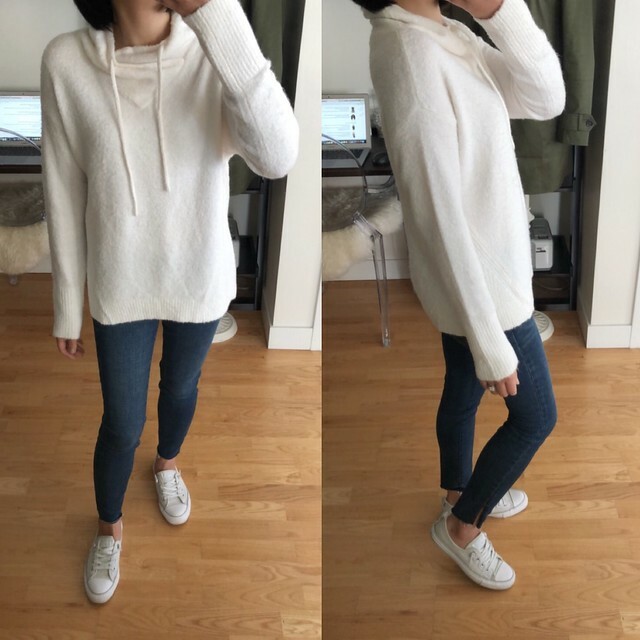 It runs true to size and has an oversized/slouchy fit as intended for this style. My only reservation is being able to wear this cardigan under more fitted coats since the excess material of the dolman sleeves will bunch up uncomfortably. 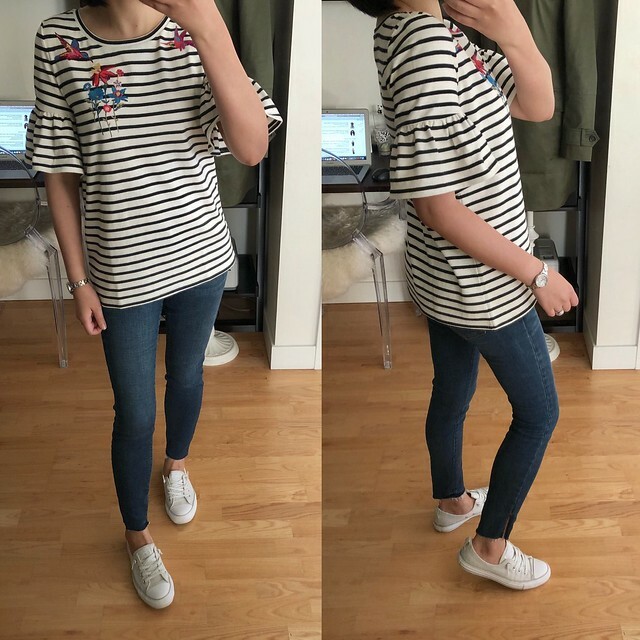 It makes a really cute and casual layer on its own. This striped top is a very similar fit as the older ruffle cuff top as seen here which I also took in size XXS regular. 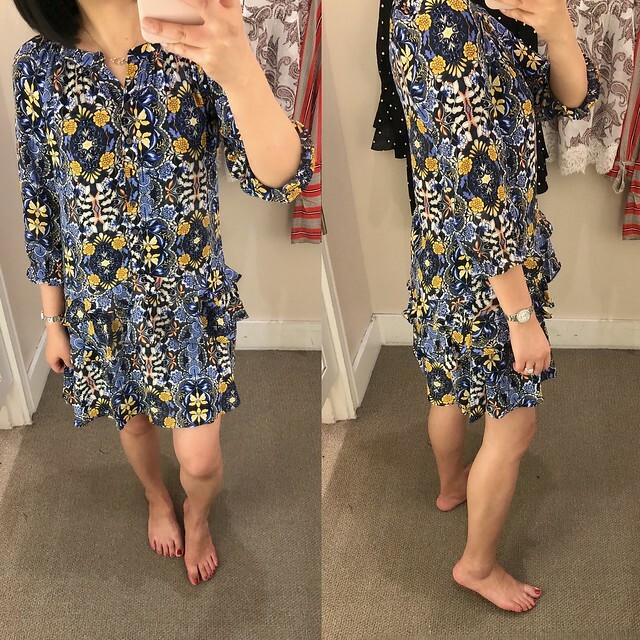 I don’t love the longer, shapeless fit on me so I’ll be returning it but the embroidered floral and bird detail is beautiful and unique. 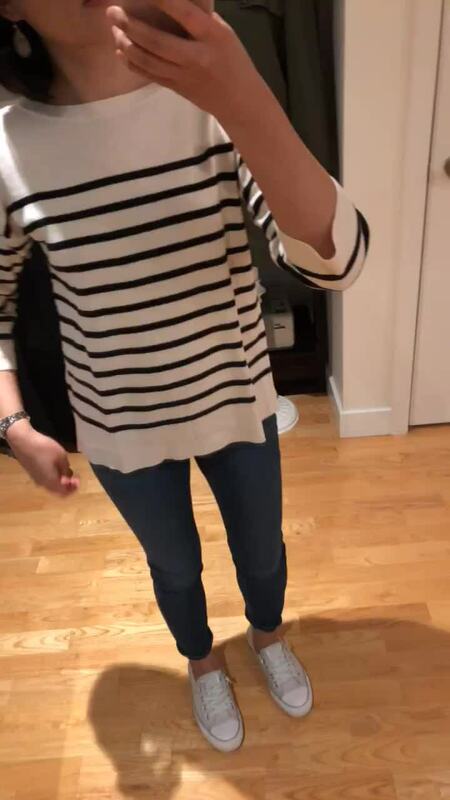 I have this sweater in the solid color as seen at the top of this blog post but I had to try on size XSP for comparison after seeing this striped version on Su. Size XSP does fit me better but I prefer the longer sleeve length of size XS regular since I occasionally have KP flare ups. 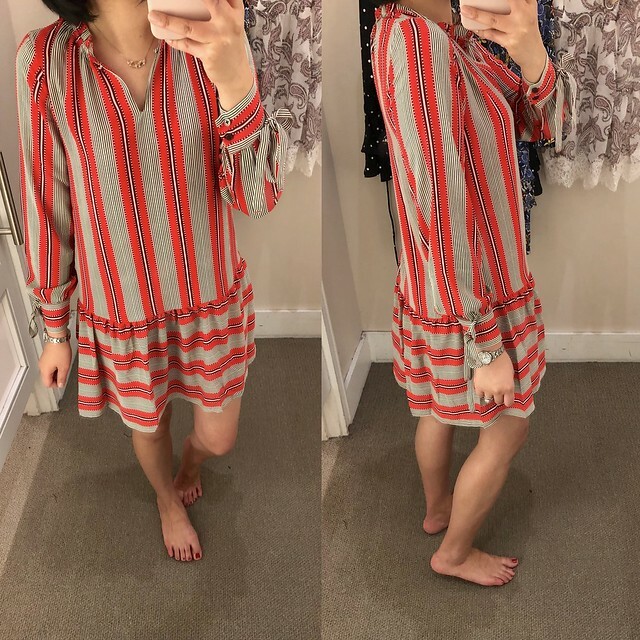 LOFT has been heavily promoting this bold and bright stripe dress and it’s a blogger favorite as seen on @bohostylefile. Su had asked me to try on a few dresses last week when dresses where on promotion for 40% off. I found that this dress runs big since sizing down to size XXSP still fits like a loose and comfortable size XSP. LOFT has been pumping out a lot of bold prints and this print looks even more lovely in person. I found that this dress runs slightly big since I fit size XXSP when I usually take size XSP. However, I noticed that the hip area for this dress do not have any give so it will pull across my hips when sitting down. You can also see size XXSP on Kileen @cutenlittle. 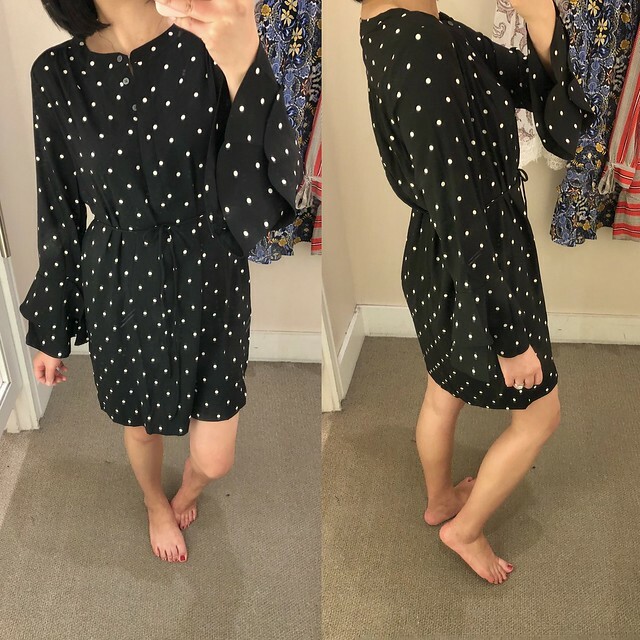 This polka dot dress is yet another dress that Su asked me to try on size we’re typically the same size at LOFT. I found that it runs about one size bigger since there is a lot of excess fabric at the waist which definitely needs to be cinched to give it some shape. 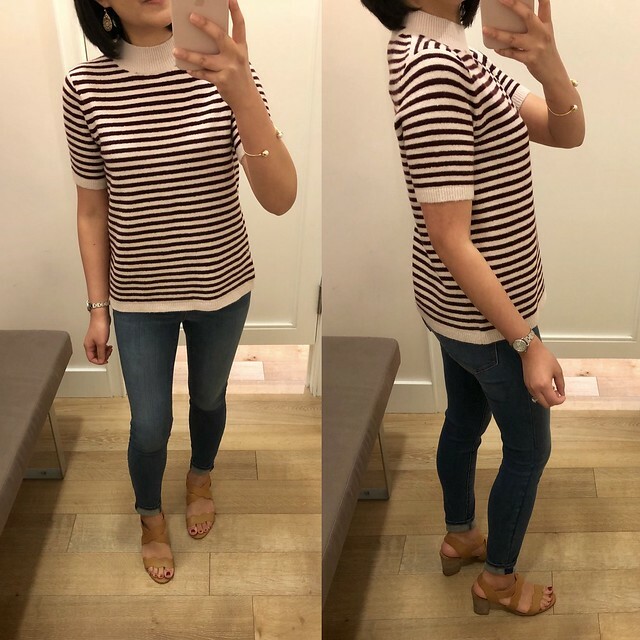 Size XXSP wasn’t available for me to try on for comparison but I would recommend sizing down for a better fit if too much material at the waist bothers you. I think it needs something more than the stringy belt it comes with for waist definition. 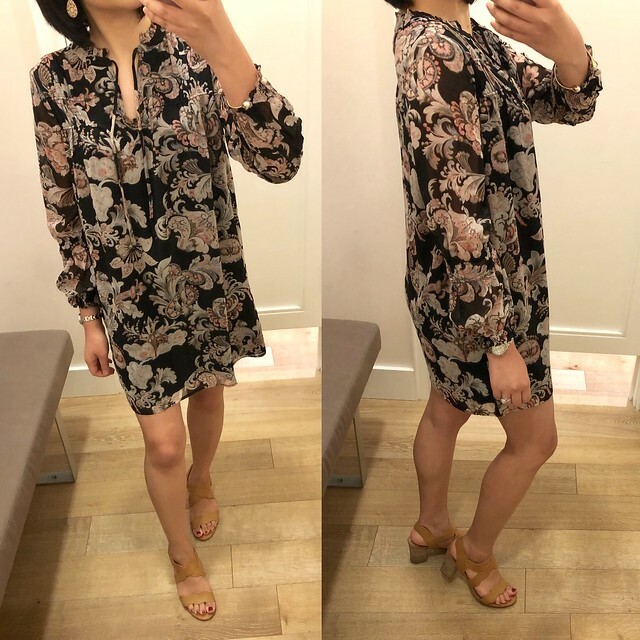 The floral print is more gorgeous in person and I really like this dress but I found that it runs short in the petite sizes. I’d consider this a mini dress and I generally prefer a more modest length. It also has a swingy fit so you may want to size down. This royal floral print is also available as a top which I tried on in size XXSP as seen here. The blouse also runs big so you can size down for a better fit. I ordered this gorgeous blouse after seeing it on @thedoubletakegirls. 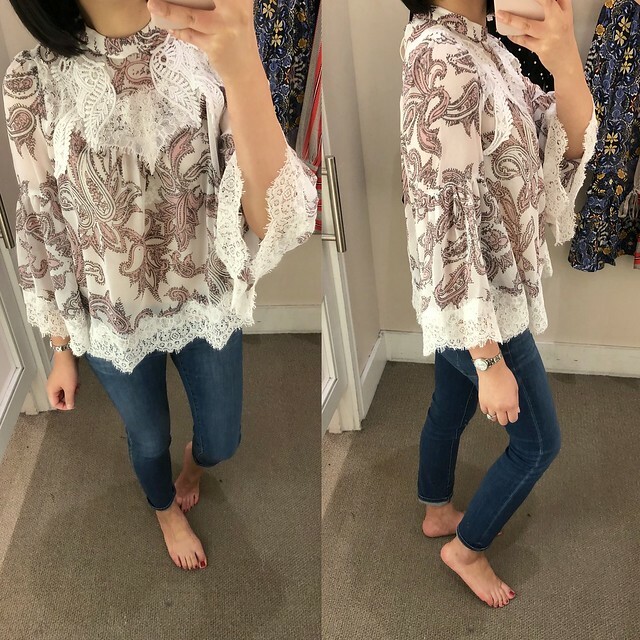 Their style is very feminine and dressy and I love the paisley print, lace details and floaty material but I can’t see myself reaching for this top very much so I’ll be returning size XXSP which I received in the mail. I’d say this top fits true to size to one size larger. 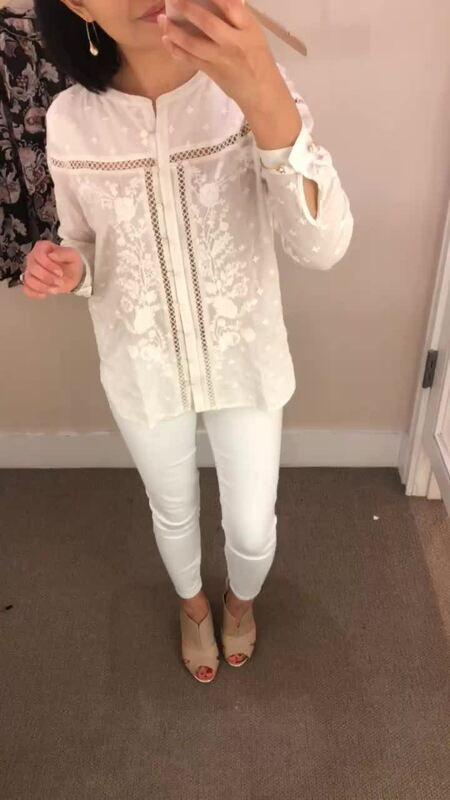 The embroidered details on this blouse caught my eye so I ordered it to try in size XXSP which was a bit too small/narrow. I tried it on in size XSP above which is my usual size at LOFT and I’d say this blouse fits true to size. The top is ivory and not white and slightly sheer so a layering cami is recommended due to the cutout details. You can also see size XS regular on Courtney @mrscocowyse. 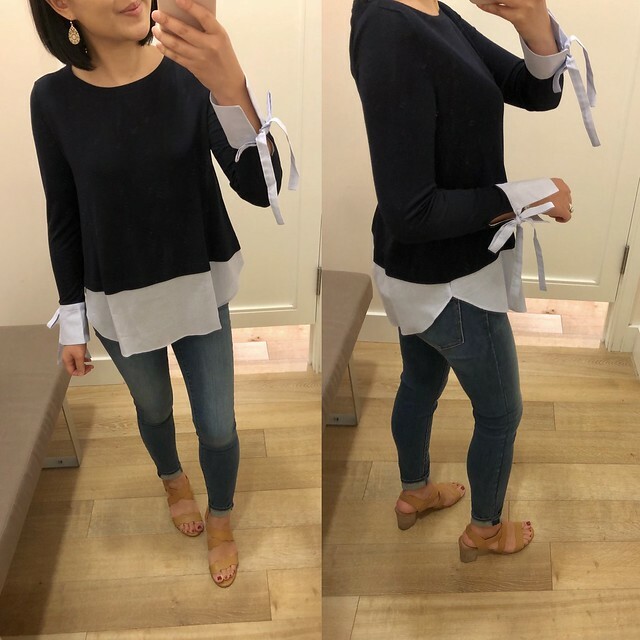 She highly recommends this top and compared it to Anthropologie style/quality and I have to agree! I ordered this split back sweater after seeing it styled by a lovely associate on @stylencharm_westfarms. This sweater runs true to size bit it has a boxy fit and I found that the sleeves are really loose/wide. I was at a loss what to layer it with since the back is open so back it went.